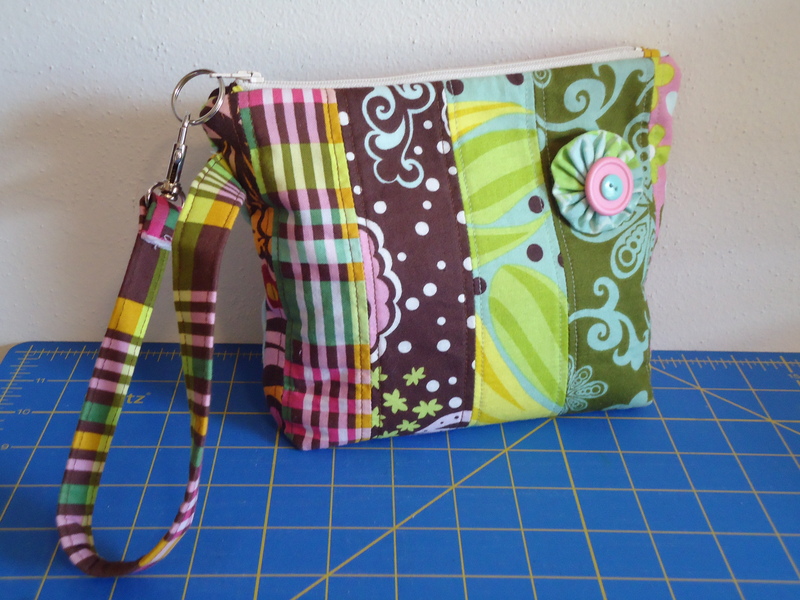 I made a bag for a friend who shares my love for chocolate lollipop fabrics. 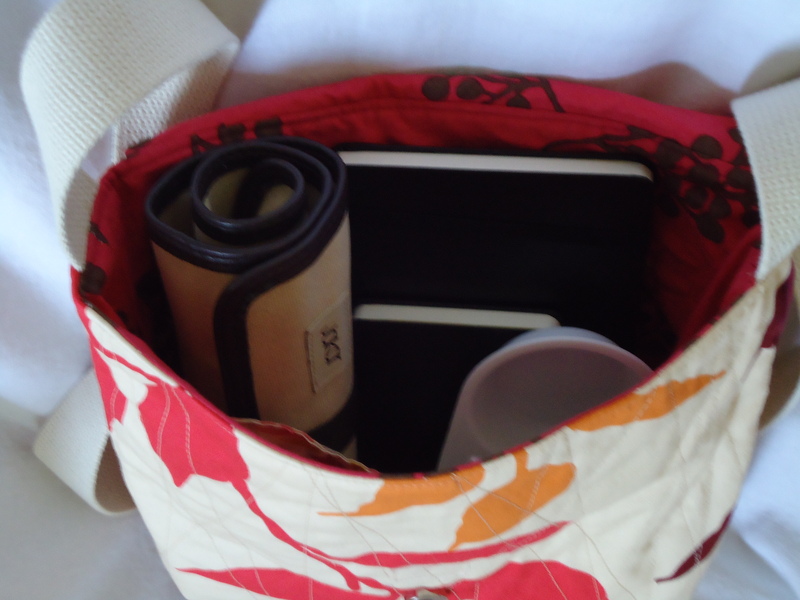 I use my bag to hold my sewing tools and notions in. 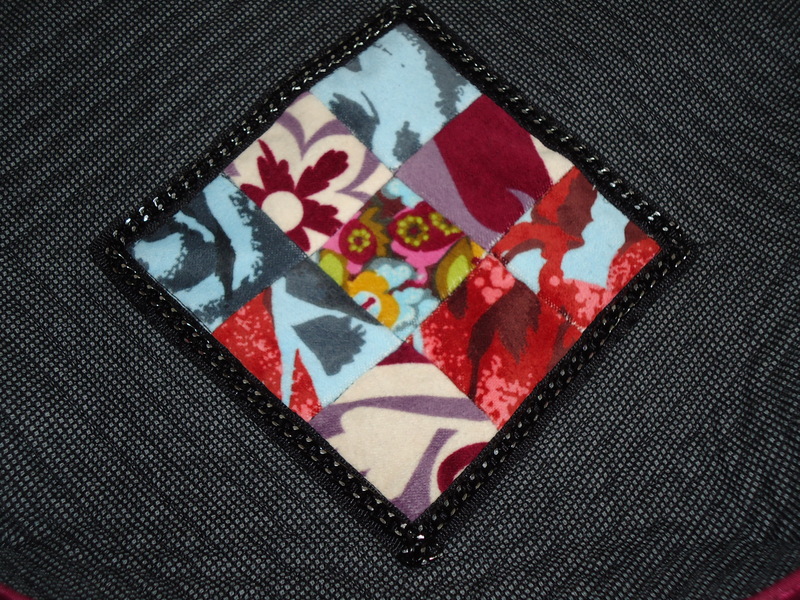 She fell in love with it when she saw mine at our quilting retreat this summer, so she requested one for herself. She sent me a big stack of fabrics, so I thought it would be cool to make this into a trade. She sent me some fabulous dots and basics that I’ve never seen before, so I’m excited to find creative ways to incorporate these fun prints into my stash. With my busy work schedule these days, it’s been awhile since I’ve done any sewing, so I was pleasantly surprised when this bag took me a little more than an hour to make. Relieved I still remember how to sew! 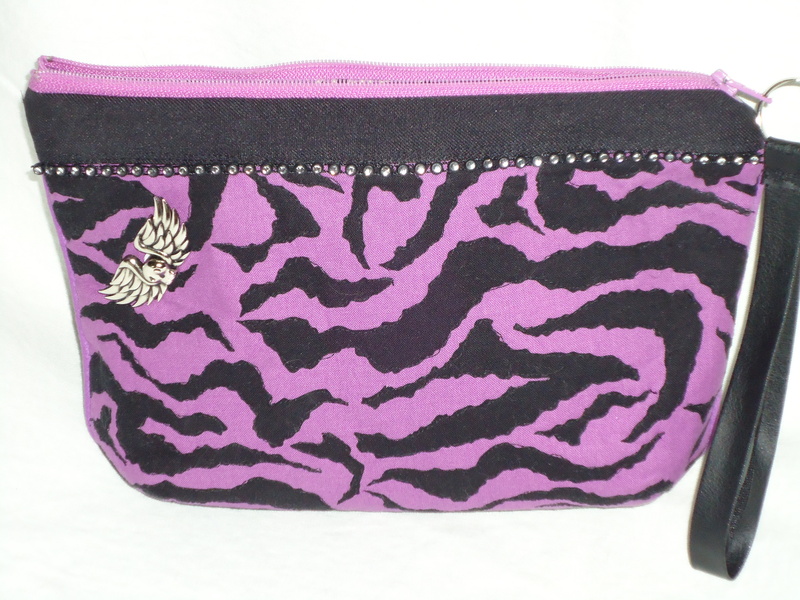 Have I ever mentioned I have a thing for zippered bags? Kind of an obsession, I should admit. They work perfectly to hold a small moleskin sketchbook and a couple drawing tools, or to hold a couple makeup goodies inside my purse. 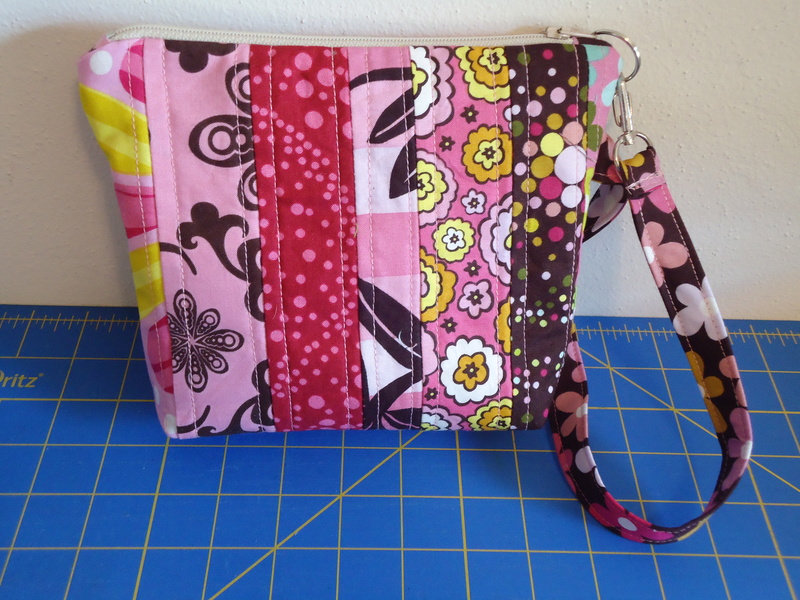 I have been trying to make more simple projects like these with fun fabrics from my stash. So I pulled a combination that made me think of candy. This style measures 6 inches wide by 4 inches tall. I pulled another fun combination from my Garden Party stash, since I haven’t made much with that collection yet. This style measures 6 inches wide by 6 inches tall. 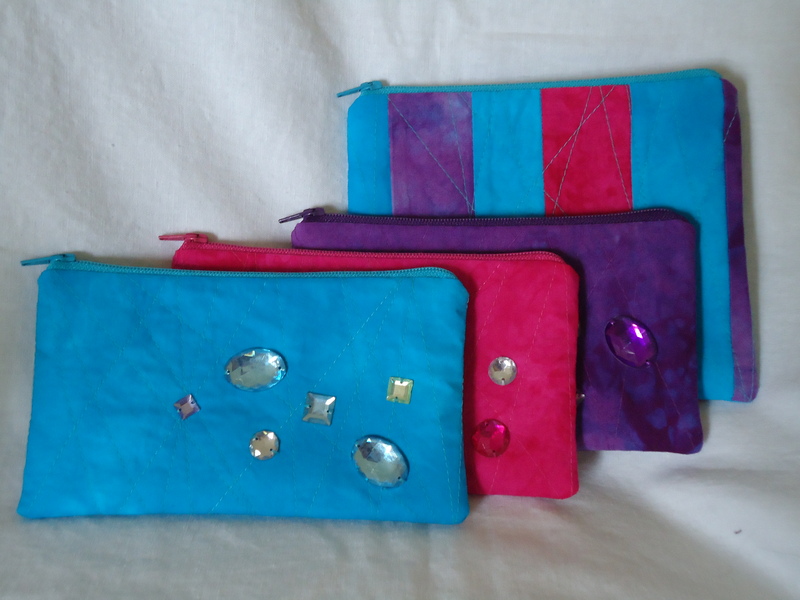 I made a little collection from hand-dyed fabrics I got from my friend Vicki. 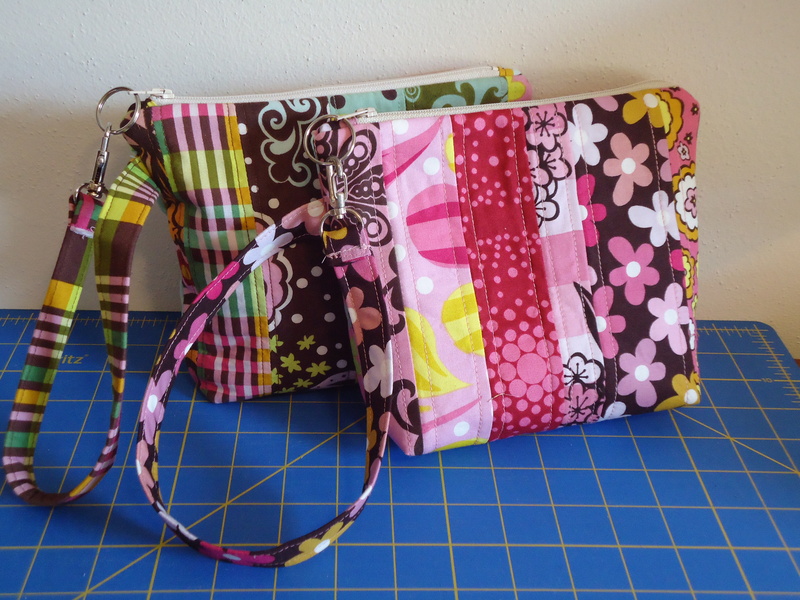 I made another fun set of zipper bags with a stash of summery prints I picked up recently. I can’t get enough of them, but I can’t possibly use all of these zipper bags, so I listed a few in my shop to share with others. 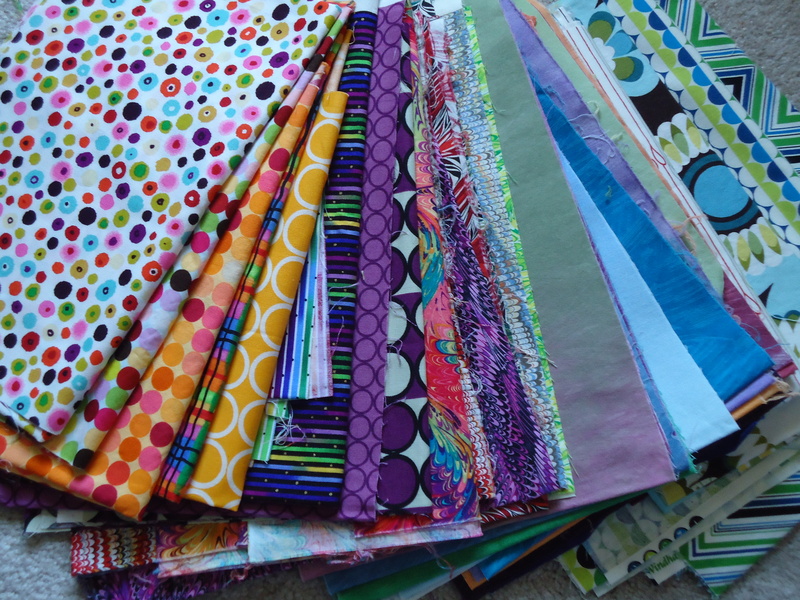 In case you’ve been wondering whether I still sew, the answer is yes, I sew a lot. Most of the stuff I’ve been making lately has been fun goodies for my shop. I have been carrying around this small clutch for the past few months. I love this little clutch, but it’s actually better for going out at night, not for carrying all my usual purse stuff and a few extras when traveling. So I decided I needed a new purse. I wanted something a little bigger to fit a sketchbook. 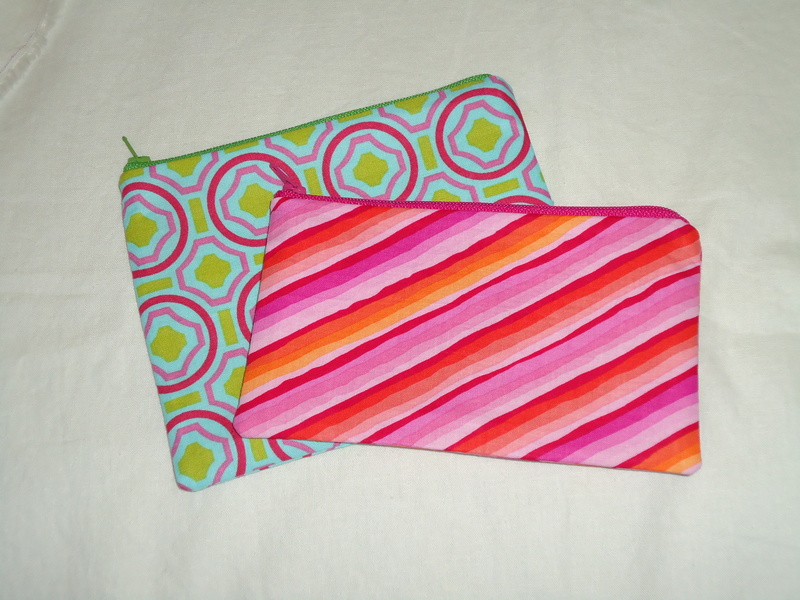 It’s an 11-inch square just like these other purses I made for my shop. 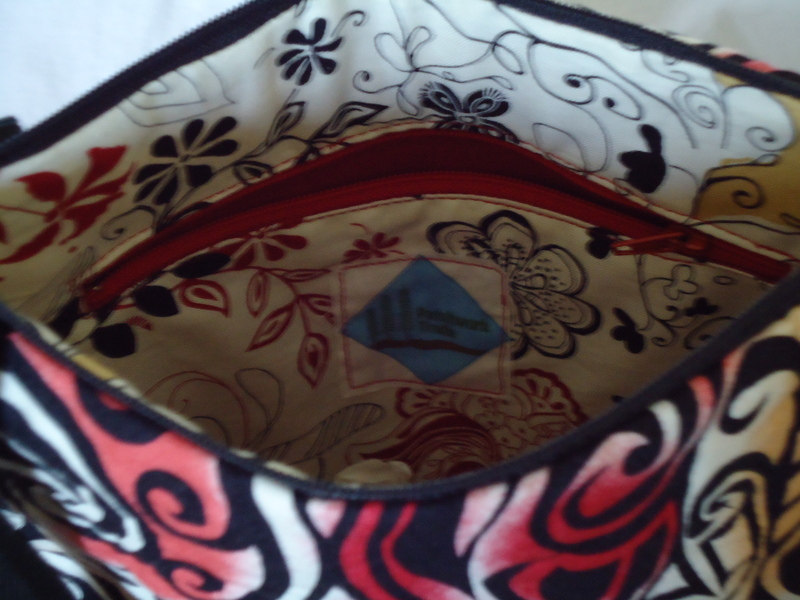 It has darts in the bottom corners to expand the inside of the purse just enough to hold my purse goodies. I also wanted something youthful and a little funky, but still functional. In my true style, I always like to add piping for that extra finished touch. 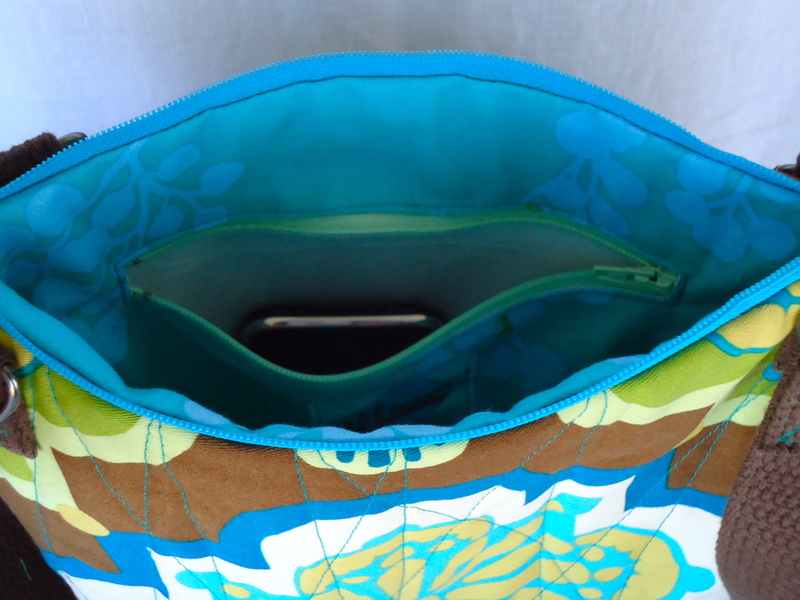 This bag has a zipper pocket inside to hold loose items, and an open pocket on the other side to slip in a notebook. That’s what I came up with – fun, isn’t it?! I really love it. 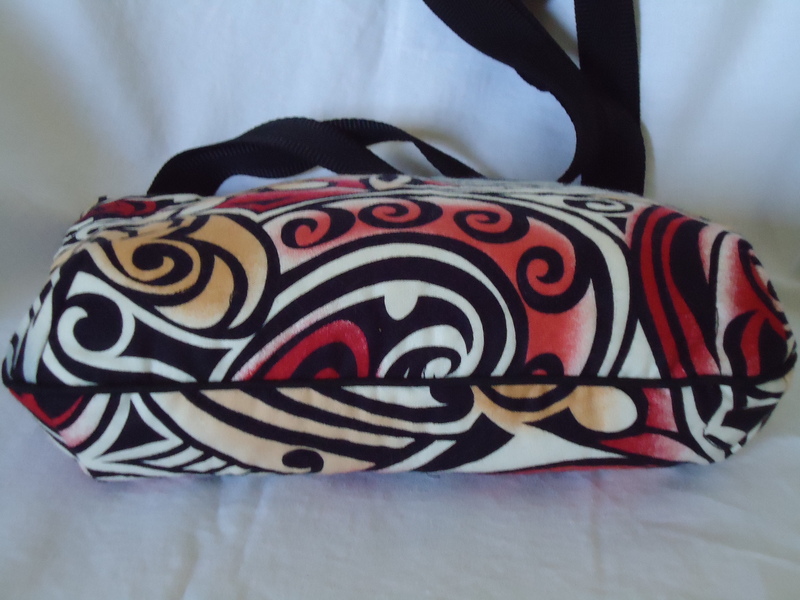 I have also been wanting to make a messenger bag to carry art supplies when traveling. I wanted this bag to be big enough to fit a sketchbook and drawing and painting tools. 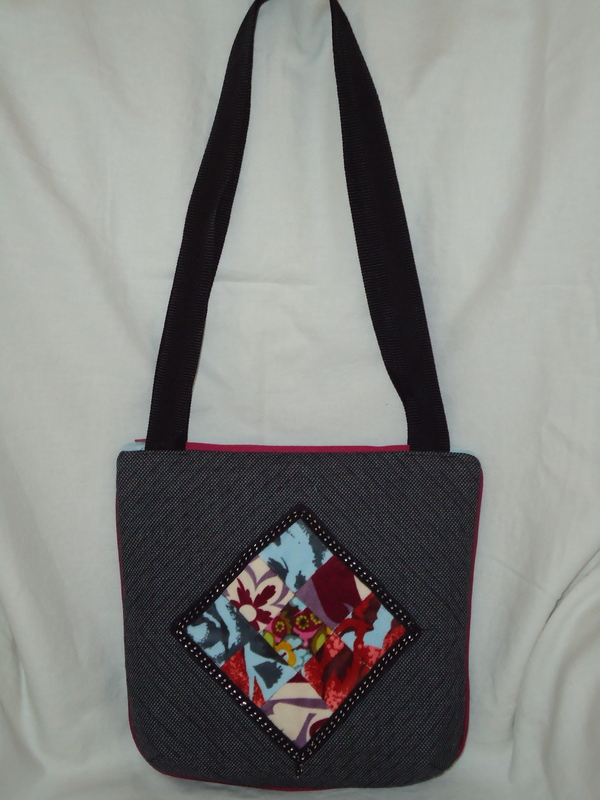 Since I couldn’t find a pattern I was in love with, I made up my own pattern for this bag, which measures 13 inches wide by 11 inches tall. 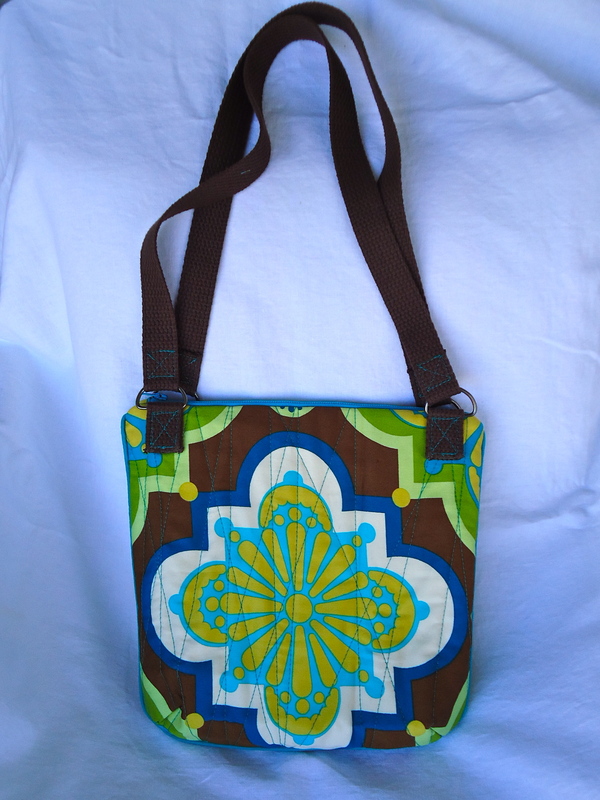 Once again, I wanted this bag to be youthful and fun, while still being functional. I like having the long natural webbing strap to sling across my shoulder. I added a little pocket with velcro closure on the inside of the flap to hold my headphones. This one is just the ticket! I used a print from the Drawing Room home dec collection by Anna Maria Horner for the outside and a print from her Garden Party collection for the lining. I wish all home dec fabric were this soft and lovely to work with! Hmm, wonder if she has plans to do more home dec fabrics. 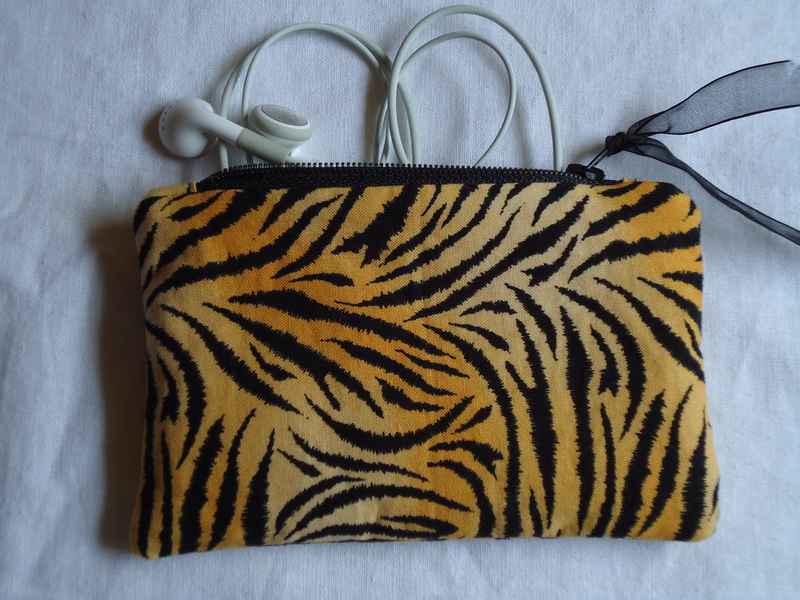 Speaking of headphones, I made a tiny little pouch to store my headphones in my purse. 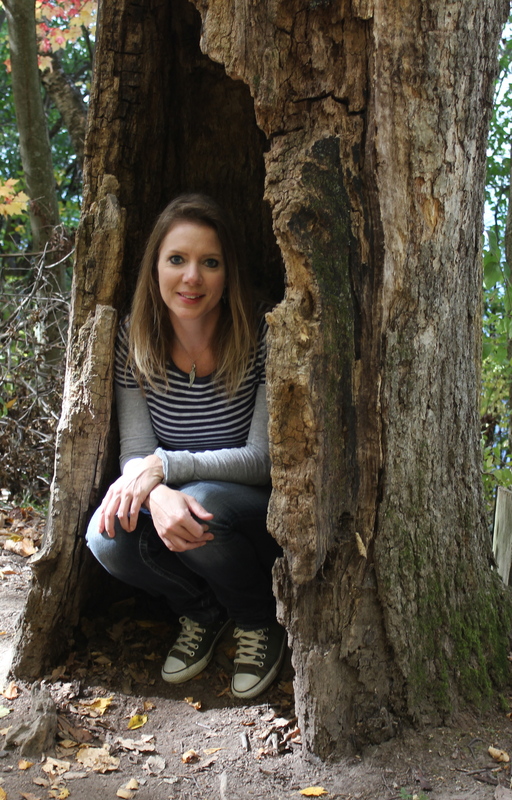 To give you perspective, I used a 4-inch zipper on this one! That is small. 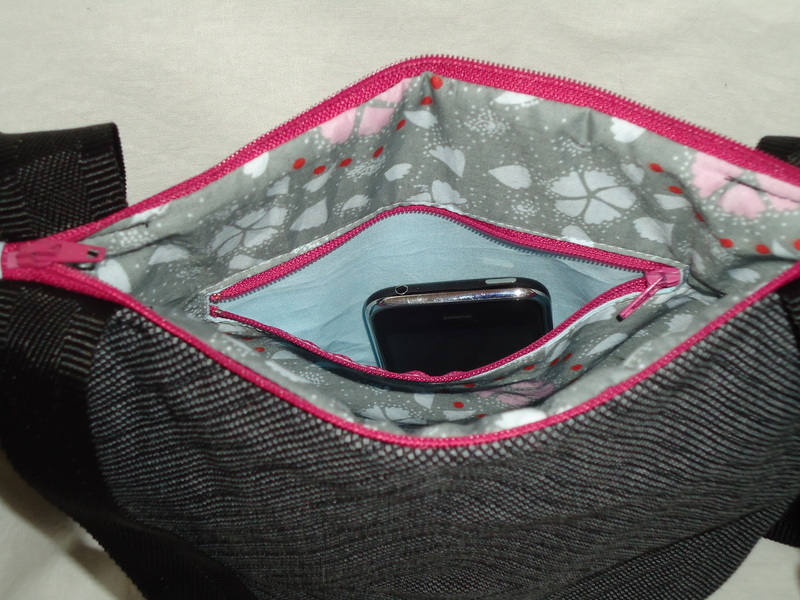 But it’s a great way to keep my headphones from getting tangled and tossed about in my purse. It is big enough to fit an ID and credit card, so I could also use this as a wallet. It’s always fun to have new purses! 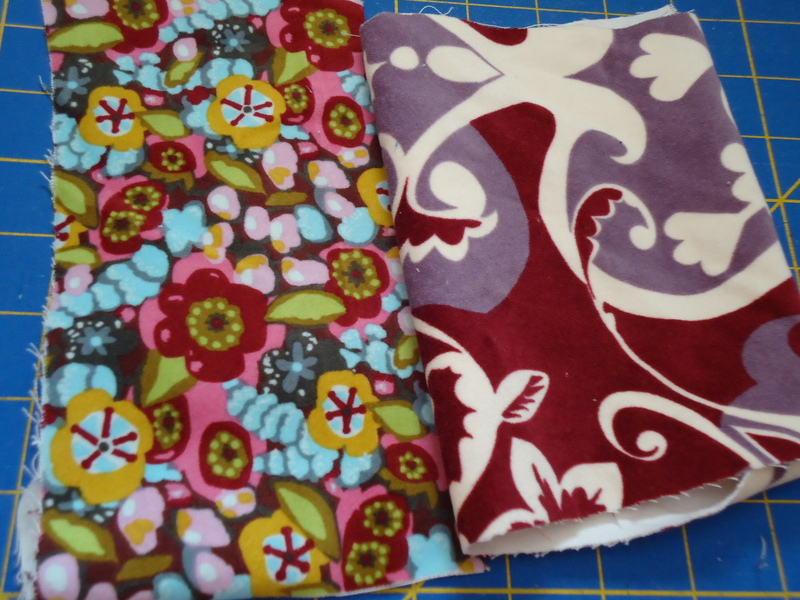 I recently ordered a bag of scraps, and found inspiration from these small pieces of cotton velveteen. 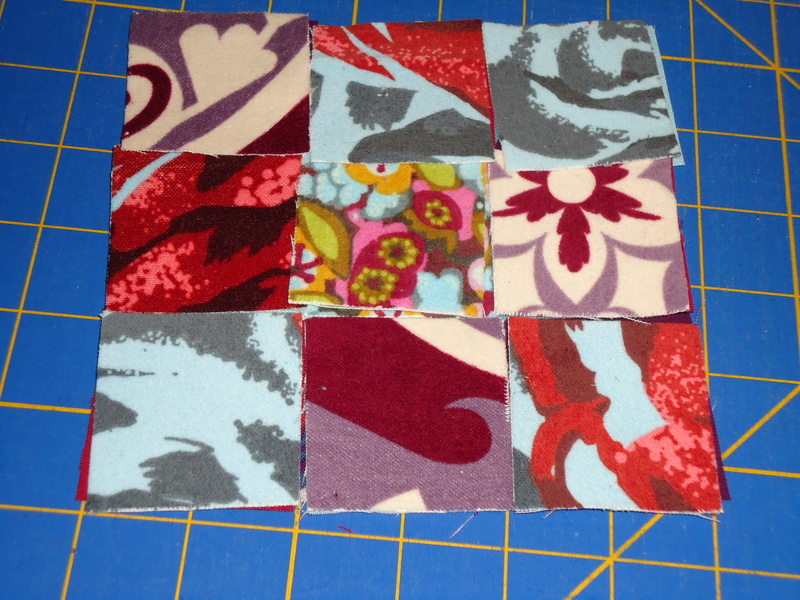 They led to a 9-patch of various velveteen scraps. That led to this patchwork set on point on a piece of black and grey suiting fabric. Then I framed it by hand sewing a chain around it. 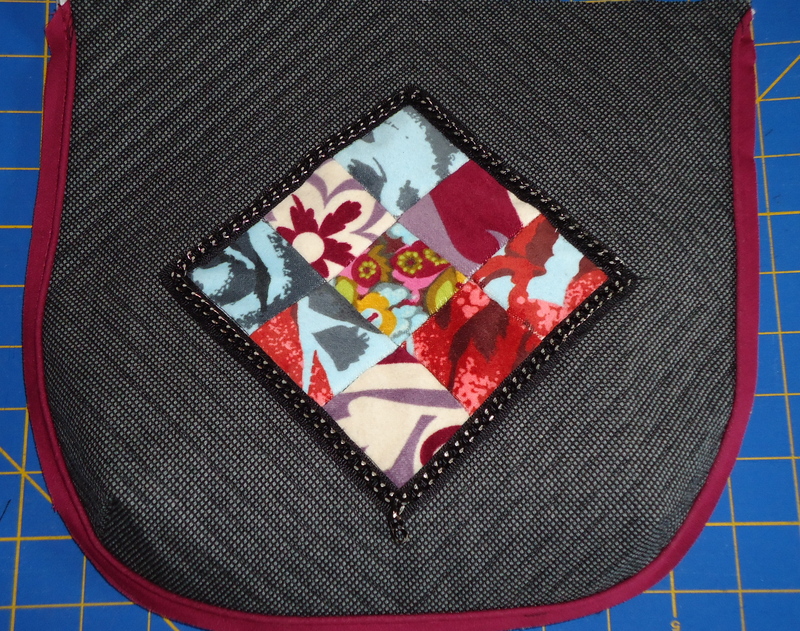 That led to quilting lines around that center, making it really pop off my canvas. Naturally, I had to frame it with a contrasting piping. That led to a new one-of-a-king bag! 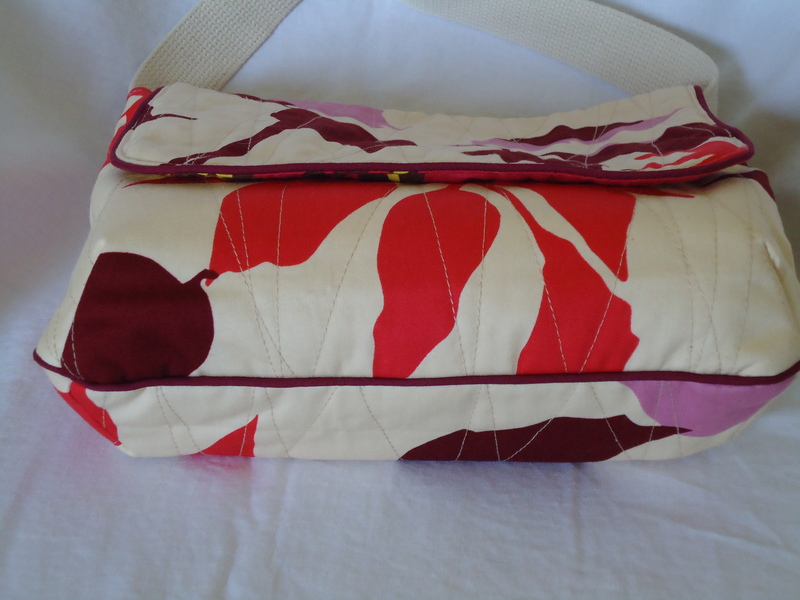 It’s a square bag measuring 11 inches all the way around, has contrasting burgundy piping and zipper, and two big pockets on the inside, one with a zipper closure and one open. 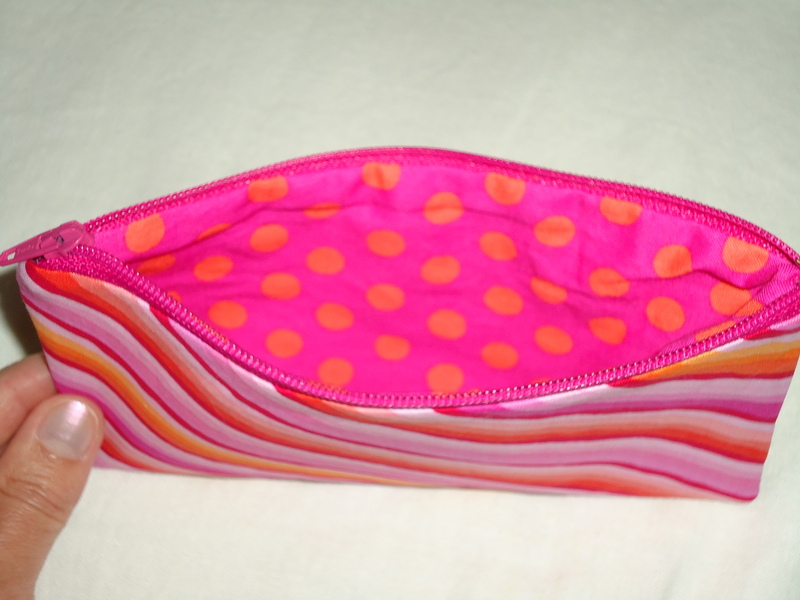 I used luscious voile fabric for the lining, which I really love working with. It’s the softest and smoothest fabric to work with. 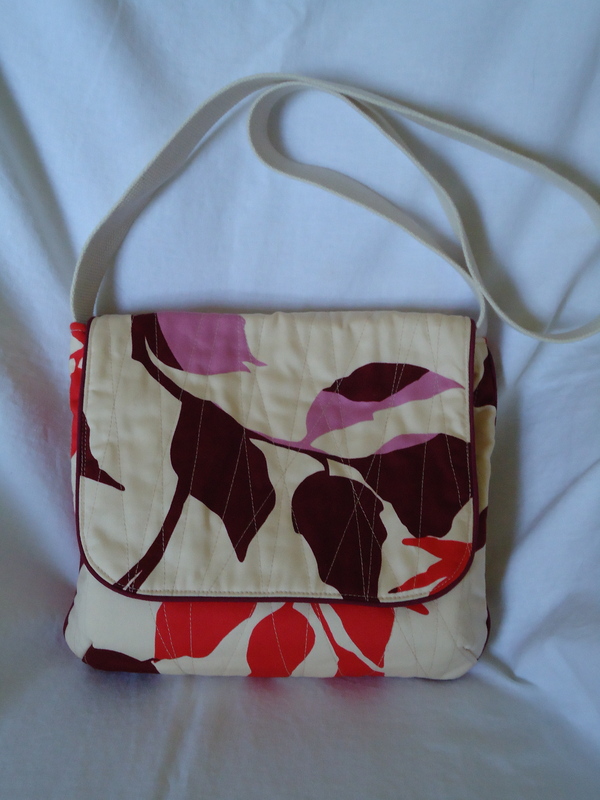 I’m not sure how the idea for this bag came from some simple velveteen scraps, but it was fun to keep pushing, trying something different at each step and experimenting along the way. I like the sophisticated look of this design, so I will definitely try this again with new colors. 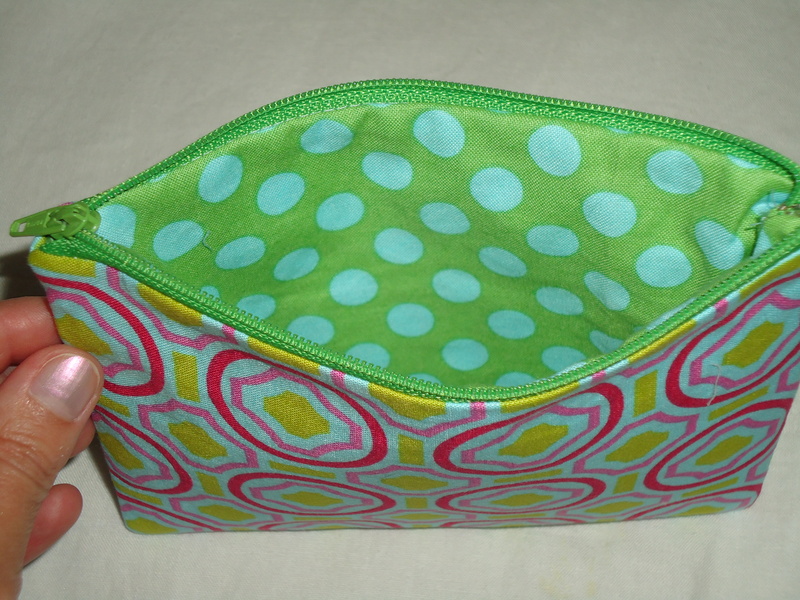 Did you see Sew,Mama,Sew’s latest promotion called the Green Grocery Bag Challenge? They started a project to encourage people to wrap their holiday gifts in reusable cloth bags. I’m so happy to see my Simple Tote Tutorial was included in the campaign. Stop by the The Green Grocery Bag Challenge Facebook page where Sew,Mama, Sew is continuing to offer wrapping ideas, sewing patterns and tips for reducing waste this holiday season. You can also join the GGBC Flickr group to share photos of your own bags and gifts wrapped in reusable bags. On a related note, I wanted to mention that my reusable bags received some great feedback at my craft show last weekend. I ended up selling about five, and used one for a drawing to giveaway. 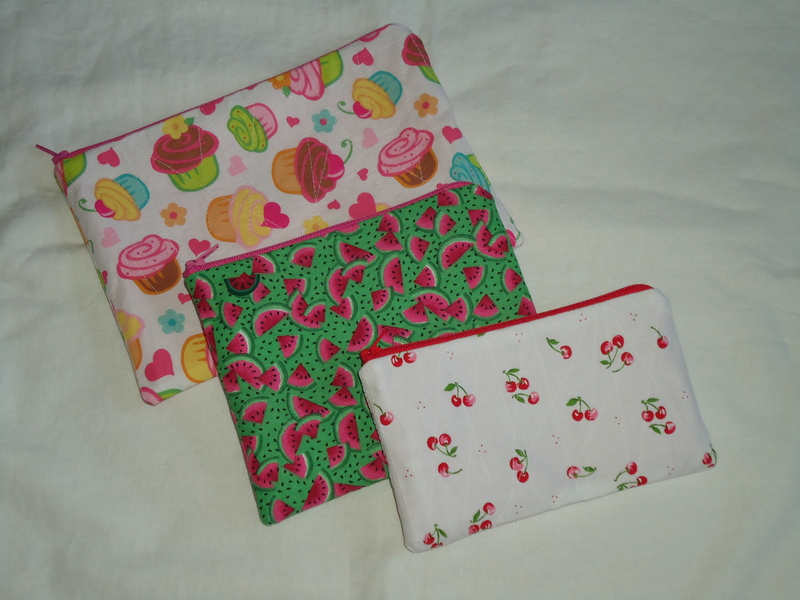 So give your gifts this year in some adorable handmade bags or clever reusable wrapping! Don’t know what a Treasury is? A Treasury is a member-curated shopping gallery comprised of 16 items chosen by the curator, items selected based on a theme or whatever the curator likes. 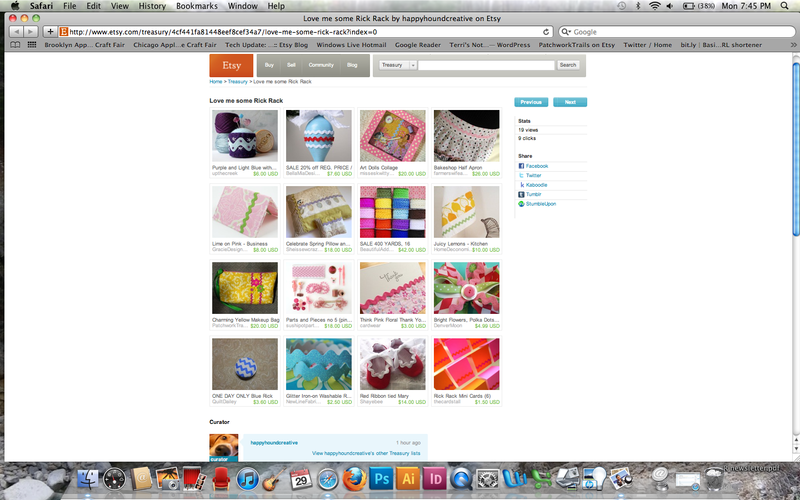 Any Etsy shop owner can create a Treasury. It’s not intended for self-promotion, but instead to acknowledge and share cool things for sale on Etsy. 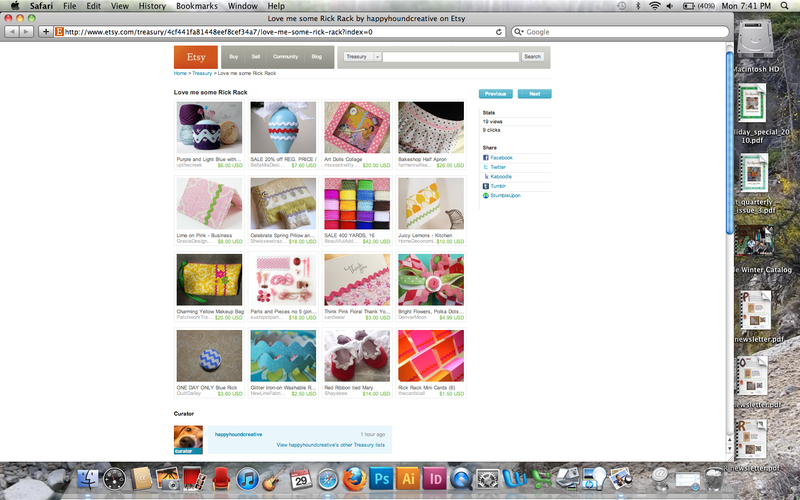 I have an idea for a theme, so I really want to curate a Treasury one of these days. Go check out all the other rick rack goodies too! 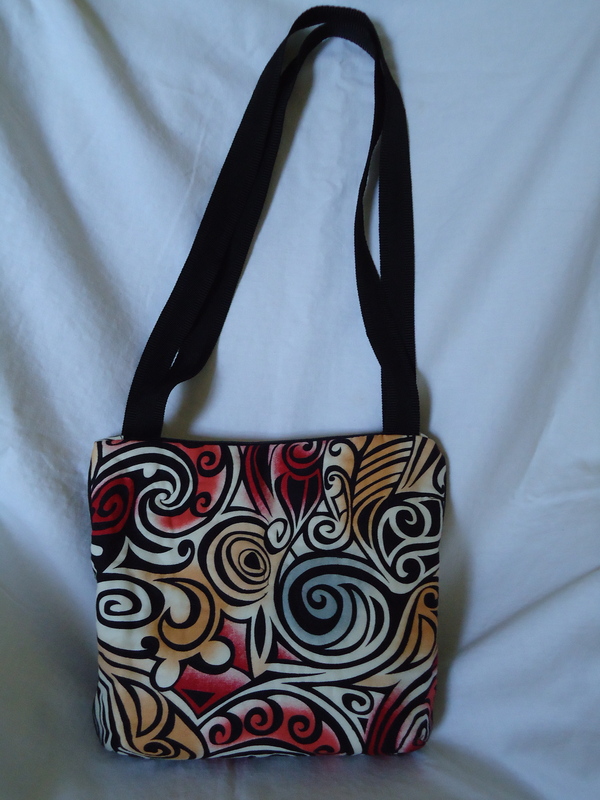 Why is it that every time I go on a trip, which isn’t that often, I feel like I need to make a new bag for that trip? 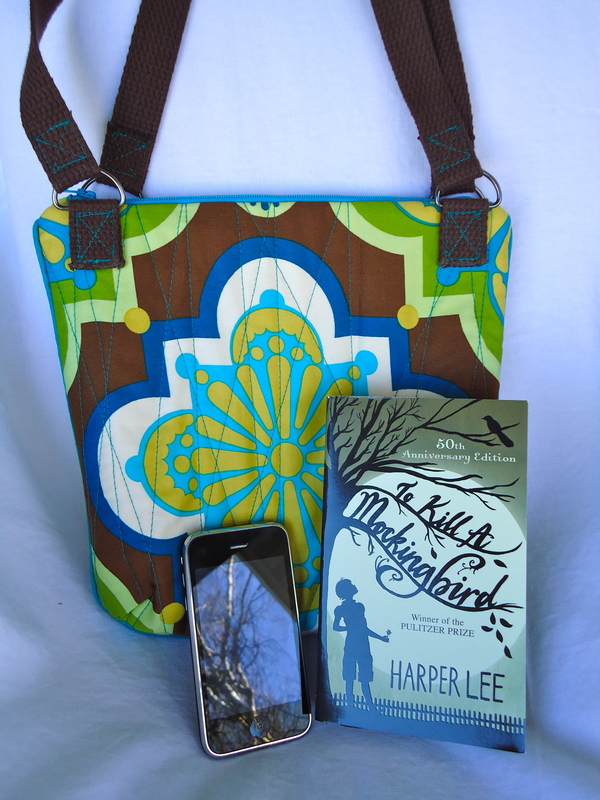 I can’t pinpoint where the inspiration for this bag came from. Maybe I dreamed it. 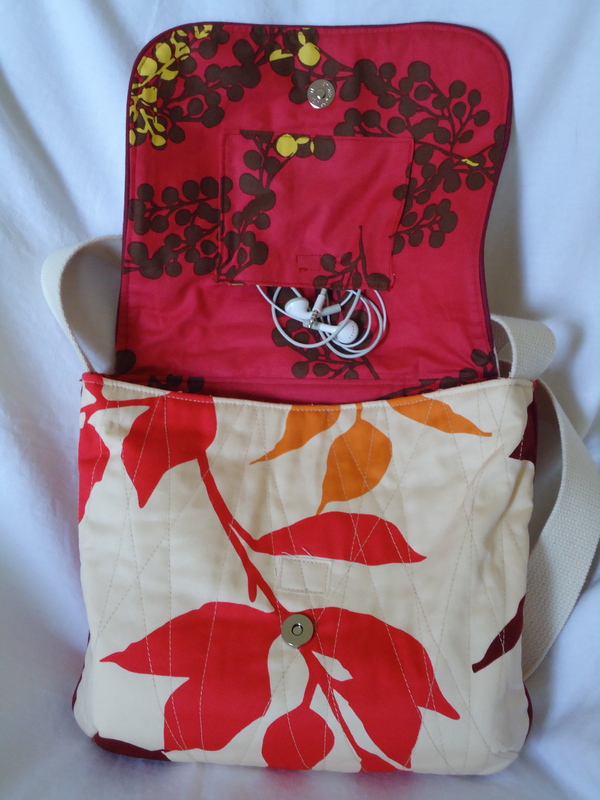 I really just wanted to play with some of the home dec fabrics I have in my stash, which seem perfect for bags. 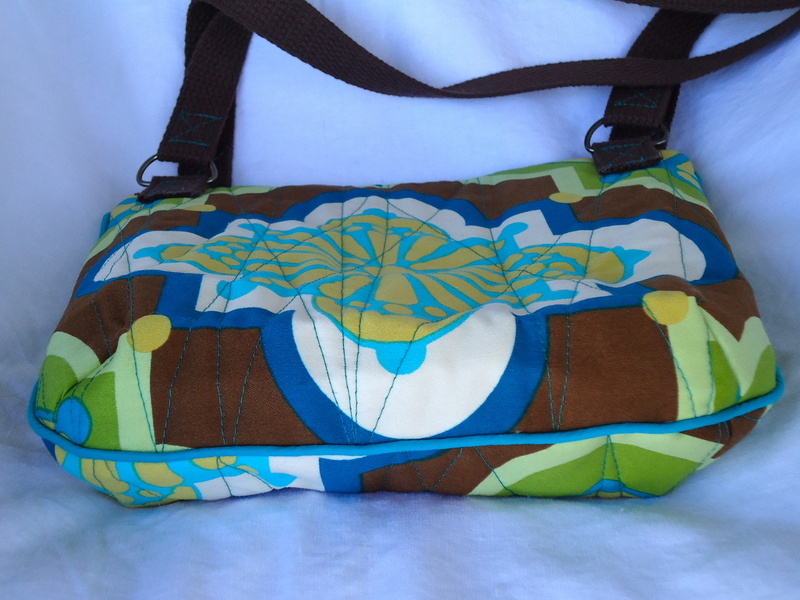 I loved this color combination of brown, teal and green, so I kept the outside embellishment simple with random zig-zag quilting lines using teal thread. 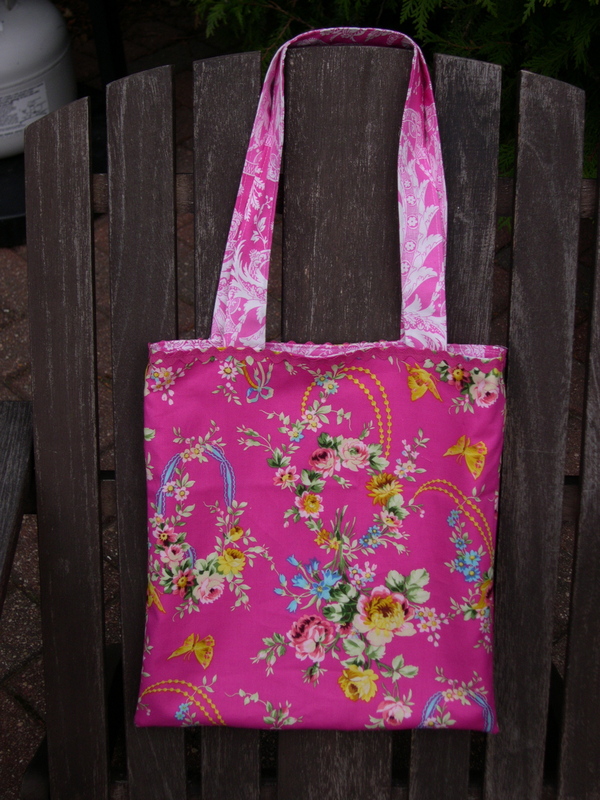 I also wanted a tote bag bigger than what I normally make. This prototype came out to measure an 11-inch square, big enough to carry all my purse stuff and fit a paperback inside too. I wanted a long strap to sling this across my shoulders, but I didn’t have enough strapping for that style. So I made two straps instead, which I think I will like better anyway. It feels more sturdy and I like being able to tuck it underneath my arm. I’m super happy with how this turned out, so I’m hoping to add this one to my repertoire. Our annual trip to New York City for my birthday bash is upon us, so I hope to see you back here in a few days!